A disk of radius R is accelerating to the right over a plane. 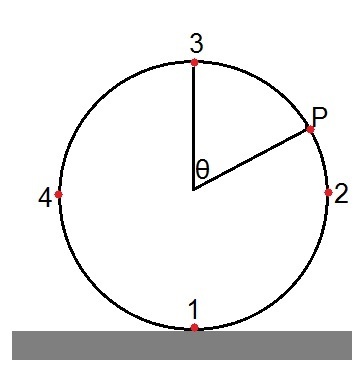 At t=0 the speed and the acceleration of the axle are v1 and a1 what is the velocity and the acceleration of each point (1-4 and point P, which makes an angle θ as shown in the figure) with respect to the plane. Note its direction. I know to compute the velocity of a given point when the disk (or wheel) is moving in a constant velocity, using the parametric equations for the cycloid curve. Point (1) is moving with a velocity equal zero, point 3 is 2v and so on. So I need some help with the accelerating case. Not grad level. They will close your question. Hi UdiBehar, I agree with conformal_gk that this is not a grad level question. Therefore I am voting to close. But maybe you are interested in supporting the creation of a PhysicsUnderflow, where such questions would be savely on-topic? I closed the thread by my self. I am sorry for the inconvenience.